Defending champions India put up a spirited fight before going down 3-4 to hosts South Korea and settling for the silver medal in the 14th Asian Games here today. Ace long distance runner Sunita Rani claimed the bronze medal in the women’s 5000 m run to bring the lone medal for India in athletics event of the 14th Asian Games here today. The Indian challenge in badminton singles event of the 14th Asian Games came to an end with ace shuttler Pullela Gopichand bowing out in the men’s quarter-final at the Gangseo Gymnasium here today. 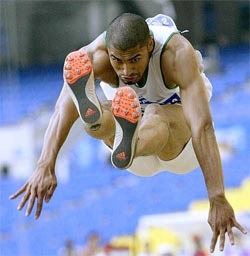 Hussein Al Saba of Saudi Arabia jumps in the men's long jump final at the 14th Asian Games in Pusan on Saturday. Al Saba won the gold medal with a length of 8.14 metres and set a new Asian Games record. Asian Games organisers are counting the huge cost of hosts South Korea’s failure to set up a dream football final with arch-rivals Japan tomorrow. A South Korea match up with fellow World Cup finalists Japan would have ensured a capacity crowd at the 53,000 seater Busan Asiad Stadium but that was scuppered by Iran’s penalty shootout win over the hosts. China won four Asian Games canoeing gold medal on Saturday and missed another by less than half a second. The Chinese were winners, however, in the day’s closest race, the men’s 500-metre double Canadian canoes. Wang Bing and Yang Wenjun came from half a second behind at the halfway point and edged Kazakhstan’s Alexander Buglakov and Alexey Cherchenko by 0.204. War-torn Afghanistan won a painful first medal at the Asian Games here on Saturday when taekwondo fighter Roia Zamani clinched a bronze in the 72-kg middleweight division. 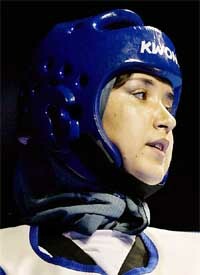 However, it was a medal achieved without her having to win a match as the field was thin with just five competitors. India’s victory was expected, though the speed with which it came will have come as a surprise to many who had come to the Wankhede on Saturday, looking for some exciting cricket. The previous evening, the West Indies batsmen had shown aggressive intent in knocking up 91 for one, but this proficiency proved to one misleading when play resumed, and by lunch itself the die had been cast. What a pity, West Indies lost a Test match inside four days. This was something unheard of from the times West Indies started playing against India till at least the time I was playing. But times have changed dramatically and with the West Indies cricket team anything is possible now. Pakistan fell to abject defeat in less than two days of the second Test against Australia, being skittled for a record-low 53 in their second innings to lose by an innings and 198 runs today. Pakistan had been dismissed for their previous record low of 59 in their first innings yesterday and their match total of 112 was the fourth worst in Test history. Mukesh Kumar and Feroz Ali, the No 1 and 2 on the Money List of the 2002-03 season of the Hero Honda Indian Golf Tour, will lead a steller field for Forest Hill Open, which starts at the Forest Hill Golf and Country Club, here from Wednesday. A full field of 72 professionals will be teeing off at the nine-hole course, which becomes the latest stop on the Hero Honda India Golf Tour. Ajeetesh and Jaskirat clinched the golf titles in their respective sections in the Northern India Open Junior, Sub-junior Golf Tournament which concluded at Noida Golf Course, last evening. In ‘A’ division, Jaskirat Dullet from Patiala won the title with comfortable margin. Young Jugraj Singh almost turned India’s hero before he shoulder-charged a Korean inside the 25-yard line to concede a penalty corner off which Korea scored the winner before a packed stadium. Keon Wook Kang (24), Woon Kon Yeo (30), Seung Tae Song (44) and Yeon Woon Koon (68) were the Korean goal scorers while India hit back through Jugraj Singh (48, 60) and Gagan Ajit Singh (53). The win was also sweet revenge for the Koreans who lost to India in the final of the last Asiad in Bangkok. India, who lost to Korea 2-4 in the recent Champions Trophy, had held Korea to a 1-1 draw in a pool match last week. After a forgettable first 45 minutes in which they conceded three goals, India counter punched superbly and almost had Korea on the mat making it 3-3. 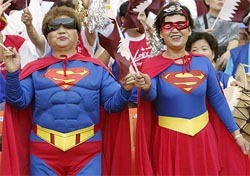 But in the end the Koreans had the last laugh scoring the winner in the dying minutes. Earlier, Pakistan ended their campaign losing to Malaysia in the bronze medal match 3-5 in the tie-breaker. The two teams were locked 1-1 after extra time. This was the first time that Pakistan finished out of the medal bracket in the Asian Games since the introduction of the sport in 1958. It was also Pakistan’s first loss to Malaysia since 1986. They have so far won seven gold, two silver and two bronze medals in the Games. India and Korea began cautiously and tried to assess each other in the opening minutes of the final. The Koreans had done their homework well and closely marked India’s danger men Gagan Ajit Singh and Dhanraj Pillay. The ploy worked well and this blunted the Indian attack. As the match progressed past the first quarter, Koreans slowly took charge with more of ball possession while the Indians began to make basic errors in trapping and passing. The Koreans played at a good speed and waited for India to commit mistakes and the Indian strikers found it difficult to penetrate the tight defence. Pillay, playing as a withdrawn forward, in particular was fumbling for most part of the first half and Gagan also failed to break the shackles. On the other hand, the Korean forwards kept threatening the Indian goal and the pick of their strikers was Seung Tae Song who played in the German league for almost two years. His marker Ignace Tirkey had a tough time and more than once Song slipped past Tirkey. Despite skipper Dilip Tirkey and Jugraj showing their class with quick and effective clearances, Song was lurking around looking for an opening and was instrumental in Korea taking the lead in the 24th minute. Song sped down the right, dodged Ignace Tirkey and made his way into the 25-yard area. He then sent in a quick cross which was deflected in by Keon Wook Kang. India counter-attacked well and almost restored parity in the very next minute but Gagan’s attempt was saved by the Korean goalkeeper. The Indian coach substituted a half-fit Prabhjot Singh in place of Daljit Singh and Vikram Pillay for Jugraj Singh. But the substitutions did not make any appreciable change to India’s fortunes as Korea stretched their lead thanks to a mistake by Viren Rasquinha, whose stick-check led to a penalty corner. Won Kon Yeo converted without any fuss to have Korea lead 2-0 at the break. Korea almost sounded India’s death knell in the 44th minute when they went 3-0 ahead with Song making good use of a tailor made cross from the right by Seong Jung Kang. But showing great tenacity India struck thrice in the space of 12 minutes to draw level. India’s first goal came only in the 48th minute. 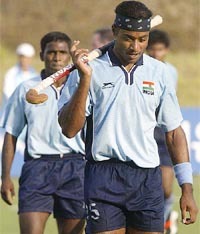 Bimal Lakra put in Deepak Thakur who was obstructed by Korean goalkeeper Yoon Kim and the Irish umpire, Colin Hutchinson promtly awarded a penalty stroke. Jugraj opened India’s account in style scooping to the left side Kim who dived the other way. The Koreans were rattled and suddenly the Indians were on song doing everything right. The flow in attacks was back and the Koreans wilted under pressure. Gagan scored India’s second goal in the 53rd minute following a combined move by Dhanraj and Deepak Thakur. Egged on by the vociferous Indian supporters who drowned the drum beats of the home crowd, India equalised in the 60th minute through a penalty corner when Jugraj Singh sounded the board with a brilliant drag flick. The Indians were now looking for the winner and the Koreans were clearly down. With only five minutes to go for the hooter, Korean substitute Jong Ho Seo almost scored. Being challenged by Ignace and Jugraj, Seo tried a back hander and the ball flew just over the crosspiece. With two minutes remaining, the Koreans got the penalty corner they wanted courtesy Jugraj and Woon Kon Yeo struck the winner past India’s substitute ‘keeper Bharat Chetri who did not know much about the brilliant flick. Indian hockey coach Rajinder Singh fully backed his players despite the team’s 3-4 title clash loss to South Korea in the Asian Games here today saying they tried their best to win the gold. Rajinder Singh, however, admitted that the forwards, full backs and the goalkeeper were found wanting in the first half which resulted in Korea slapping two goals on the team. “The Koreans did surprise us. We failed to click for the full 35 minutes. The forwards, full-backs and the goalkeeper were not up to the mark,” he said. India, who had drubbed arch-rivals Pakistan in the semi- finals, had to settle for silver after they conceded a goal in the dying minutes. After the dazzling performance on the first four days of the track and field events, it was a rather uneventful outing for the Indians who could manage just one medal with none of the other athletes in action being able to make much of an impact. With the addition of one more bronze medal to the kitty, India’s tally in the athletics event went up to 13 — six gold, four silver and three bronze medals. The 23-year-old Sunita, who had clinched the gold medal in the women’s 800m on Thursday, could not match the speed and stamina of the Chinese and Japanese runners today though she did reasonably well to break the existing Games record along with six other competitors. Sunita tried to keep pace with the first two runners till the midway stage of the race before falling back to eventually finish with a timing of 15:18.77 sec on a day which saw the Chinese athletes doing the bulk of the medal grabbing. Sunita, a last minute inclusion in the squad, had slipped to the fifth position at one stage but did well to recover in the last two laps to make it to the podium. The gold medal in the event was bagged by China’s Yingiie Sun who established a new Games record clocking an impressive 14:40.41 sec while the silver medal was taken by Japan’s Kayoko Fukushi with a timing of 14:55.19 sec. Proving to be far superior than most of the competitors in the fray, Sun maintained her lead right through the gruelling race and beat a couple of runners by more than a lap when she crossed the finishing line. “It was always going to be tough since the Chinese and Japanese are very strong in this event. I just wanted to improve my performance and am happy with the bronze medal,” Sunita said. Hardeep Kaur took the fourth position in the women’s hammer throw event hurling the iron ball to a distance of 59.36m which was not good enough for getting her a medal. Hardeep achieved her best throw in the fifth attempt after her effort to improve on the throw in the previous attempt did not bear fruit as it was a foul throw. China’s Yuan Gu did not face much challenge as she pocketed the gold medal in the event with a throw of 70.49m while compatriot Yinghui Liu won the silver medal with an effort of 66.73 m.
In the men’s 1500m, India’s Kuldeep Kumar was a bit of a disappointment as he finished seventh with a timing of 3:49.37sec with Bahrain’s Rashid Ramzi taking the honour with an effort of 3:47.33 sec. 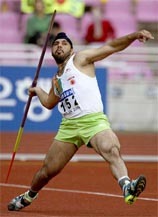 In the men’s javelin event, Harminder Singh took the sixth spot with an effort of 75.93m falling well behind the top three finishers. He achieved his best throw in his fourth attempt. China’s Rongxiang Li put up a sterling performance to grab the gold with a throw of 82.21 though falling well short of the Asian Games record of 83.38 which stands in the name of Zhang Lianbiao of China. The men’s 4x400 relay team comprising Jata Shankar, Paramjeet Singh, Satbir Singh and Bhupendra Singh kept their medal hopes alive by qualifying for the final after finishing second in the heats with a timing of 3:05.14 sec. Gopichand went down to South Korea’s Seung Mo Shon in straight games 9-15 11-15 to the disappointment of the Indian contingent which was expecting at least a bronze medal from the former All-England champion. Gopichand, now below 50 in world rankings due to poor form and injury, committed a number of unforced errors against the South Korean who enjoyed vociferous home crowd support. After conceding the first game, Gopichand made a valiant effort to pull back but the Korean, despite making a few mistakes under pressure, did not allow the Indian to gain an upper hand. Gopichand seemed to have lost his concentration midway through the second game and the local favourite was quick to pounce on the chance and increase his lead substantially. 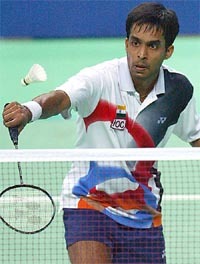 Shon admitted after the match Gopichand had proved to be a tough opponent. “He is as tough as they come and today he showed glimpses of his top form. I was lucky to win in two games.” The only other Indian in the fray, Abhinn Shyam Gupta had made his exit in the very first round of the singles event losing to world champion Hendrawan of Indonesia. Asian Games organisers are counting the huge cost of hosts South Korea’s failure to set up a dream football final with arch-rivals Japan tomorrow. A South Korea match up with fellow World Cup finalists Japan would have ensured a capacity crowd at the 53,000 seater Busan Asiad Stadium but that was scuppered by Iran’s penalty shootout win over the hosts. The Busan Asian Games organising committee (BAGOC) said the team’s defeat had derailed plans to sell the 11,000 remaining first class seats for the final with total losses estimated at 2.3 million dollars. A BAGOC spokesman added that thousands of fans, who had bought tickets for the final expecting South Korea to be involved, had asked for refunds or for tickets to be exchanged for the bronze-medal match between South Korea and Thailand in Ulsan tomorrow. “We are being bombarded with demands for refunds or a change in tickets,” the spokesman told the Yonhap news agency. South Korea, boasting five of their World Cup stars, failed to take their scoring opportunities against the defence-minded Iranians and paid the price when captain Lee Young-Pyo missed his spot kick in the shootout. Coach Park Hang-Seo took full responsibility for the defeat and there is speculation in local newspapers that he will quit the job after tomorrow’s match despite recently signing a two-year contract worth a reported $ 2 00,000. Park has been under pressure ever since replacing his old boss Guus Hiddink, a national hero in South Korea after leading the team to the World Cup semi-finals. “You cannot compare this side to the team which played in the World Cup,” said a sombre Park. Park will be hoping that Lee Young-Pyo and Park Ji-Sung, who were largely anonymous against Iran, will reproduce the form they showed under Hiddink in the World Cup. Thailand, beaten 3-0 by Japan in the other semi-final, will be without sweeper Nirut Surasiang who badly injured his knee in the last four clash and will be out of action for nine months. Left winger Anucha Kitpongsri will also be absent with a knee injury. Nine-man Thailand beat South Korea in the quarter-finals of the Asian Games four years ago and coach Peter Withe knows the hosts will be keen for revenge. The Chinese pair also had won gold in the 1,000-metre race two days earlier. Meng Guanliang, gold medalist at 1,000 metres, added victory in the 500-metre race in single canoes, beating South Korea’s Par Chang-kyu by 0.396 second. Nursing a cut over her right eyebrow, she said her achievement would encourage other women in her country to participate more in society after the ousted Taliban regime suppressed their activities. India’s victory was expected, though the speed with which it came will have come as a surprise to many who had come to the Wankhede on Saturday, looking for some exciting cricket. The previous evening, the West Indies batsmen had shown aggressive intent in knocking up 91 for one, but this proficiency proved to one misleading when play resumed, and by lunch itself the die had been cast. With the wicket deteriorating rapidly, batting was always going to be difficult on the last couple of days, but this had become a minefield, giving the hapless visiting players no chance. As I mentioned earlier, on such tracks Kumble and Harbhajan can be lethal, and the West Indies batsmen simply had no answer. I thought Ganguly got it dead right by not allowing the batsmen to settle down and the game to meander. 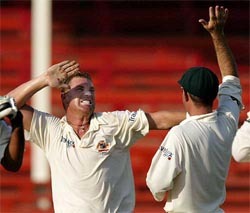 Pace bowling can be meat and drink to the West Indians, but against spin they have never been comfortable. Ganguly did the smart thing by getting spin from both ends, and since these two were high quality bowlers, it meant that the batsmen were always under pressure. From his bowling changes, and the way he set the field for Kumble and Harbhajan, it was apparent that Ganguly is always thinking as a captain. These two spinners bowling in tandem were too hot a curry for the West Indies to handle. Harbhajan bowled beautifully, varying his line and pace, getting the batsmen in two minds. The wicket he will treasure most is Carl Hooper’s whom he beat in the air, and forced a misdrive for a return catch. With the West Indies captain falling cheaply, the fight vanished from the rest of the team. What a pity, West Indies lost a Test match inside four days. This was something unheard of from the times West Indies started playing against India till at least the time I was playing. But times have changed dramatically and with the West Indies cricket team anything is possible now. I feel sorry for them but it was the Indian performance, which filled my heart with pride. When West Indies began today morning at 91 for 1, I thought they might try and take the match into the last day but three hours is all it took for the Indian spinners, led by Harbhajan Singh and Anil Kumble to bowl India to a win. Harbhajan was the star as he took seven wickets while Kumble had three. Well, Kumble bowled as well as Harbhajan but got fewer rewards for his performance. Still I am sure he would be as happy as any member of the Indian team would because beating West Indies in a Test will ever be a moment to cherish. Well done India. I wasn’t very happy to see the way the Wankhede Stadium pitch played in this Test because the Indian board had sent its pitches committee to relay pitches across the country and make them bouncier. As far as this pitch went, it was disappointing for the game at least. I just hope the pitches at Chennai and Kolkata play better than this. Otherwise the importance of such victories will be lost. I guess India had made sure of the win when they scored 457 in their first innings. What shocked us all was that the West Indian batsmen could not get to that total even in their two innings. A lot depended on Carl Hooper but he fell short of the expectations. A big innings from the West Indian captain may have saved the game for the visitors but that was not to be. Now, they must give a serious thought to their plan for the next two Tests. Their batsmen have to put up scores in the excess of 300-350 if they wish to give a fight to the Indians. Otherwise, I see a scoreline of 3-0 in our favour . Pakistan fell to abject defeat in less than two days of the second Test against Australia, being skittled for a record-low 53 in their second innings to lose by an innings and 198 runs today. Pakistan had been dismissed for their previous record low of 59 in their first innings yesterday and their match total of 112 was the fourth worst in Test history. 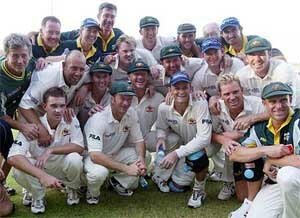 The result means Australia, who won the first Test by 41 runs in Colombo, take an unassailable 2-0 lead in the three-Test series. Opener Matthew Hayden had top-scored with a patient 119 — his ninth Test century — to help Australia take a commanding first-innings lead of 251 over Pakistan on the second day. The left-handed Hayden, unbeaten on 74 overnight, came close to carrying his bat but was the ninth batsman to be dismissed before Australia were bowled out for 310. The Australian bowlers once again ripped apart their opponents’ batting order with only two Pakistan players making double figures — opener Imran Nazir top-scoring with 16 and Misbah-ul-Haq totalling 12. Fall of wickets: 1-54, 2-145, 3-148, 4-148, 5-224, 6-252, 7-285, 8-304, 9-310. Bowling: Waqar 8-2-25-0, Akhtar 14-3-42-1, Kaneria 26-2-116-1, Razzaq 10.1-3-22-3, Saqlain 34-2-83-4. Mukesh Kumar and Feroz Ali, the No 1 and 2 on the Money List of the 2002-03 season of the Hero Honda Indian Golf Tour, will lead a steller field for Forest Hill Open, which starts at the Forest Hill Golf and Country Club, here from Wednesday. A full field of 72 professionals will be teeing off at the nine-hole course, which becomes the latest stop on the Hero Honda India Golf Tour. The four-day tournament, to be followed by a gala Pro-Am on Sunday, offers a purse of Rs 10 lakh. The winner’s cheque will be worth Rs 1.62 lakh, while the runner-up will be richer by Rs 1.12 lakh. Among the other stars who have confirmed for the tournament are twice winners on the tour this season, No 3 Digvijay Singh and No 5 Vijay Kumar, the evergreen Gaurav Ghei, twice Honda-Siel PGA champion Uttam Singh Mundy, veteran Rohtas Singh, twice Indian Open champion Ali Sher, reigning Hero Honda Masters champion Harmeet Kahlon and exciting youngsters like Rahul Ganapathy, Rahil Gangjee and Jaiveer Virk Kahlon, Amritinder Singh, Ranjit Singh, K. S. Sibia and Rajiv Kumar will lead the local challenge. An added attraction for the tournament will be the presence of three foreign players — Dubai-based Australian Steve Kent, Bangladesh’s Mohamed Norul Islam Ghani, who won the PGAI Qualifying School this season. Ajeetesh and Jaskirat clinched the golf titles in their respective sections in the Northern India Open Junior, Sub-junior Golf Tournament which concluded at Noida Golf Course, last evening. In ‘A’ division, Jaskirat Dullet from Patiala won the title with comfortable margin. The scores were Jaskirat 293 (75,72,75,71), Shaurya Singh, Delhi 304 (75,76,80,73) and Ranjit Singh, Kolkata 307 (79,75,77,76). In the ‘B’ division, local lad Ajeetesh Sandhu played consistently during all the four days of the meet. His best round was two at par on the third day. Title proved a birthday gift for Ajeetesh who turned 14 on October 9. Another local golfer Zoravar Singh finished at third place in ‘B’ Division. Scores were Ajeetesh 307 (79, 78 74,76), Gaganjeet Bhullar 312 (79, 78, 79, 76) and Zoravar Singh 329 (83, 81, 81, 84). In ‘C’ division, Amanjyot Singh of Jaipur won with a gross score of 324. Scores: Amanjyot 324 (80,82,80,82), Siddharth Seth 348 (86,90,89,83) and Diyanshu Bajaj 354 (89,85,90,90). In ‘D’ division, K. Josh of Kolkata won with 276 (92,96,88) gross scores. Rommel Majumdar had gross scores of 277 (93,94,90) while Zubin Nijhawan had 311 (108,104,99).